Why Should I Enter a Tournament? I have been receiving a lot of questions lately about tournaments. 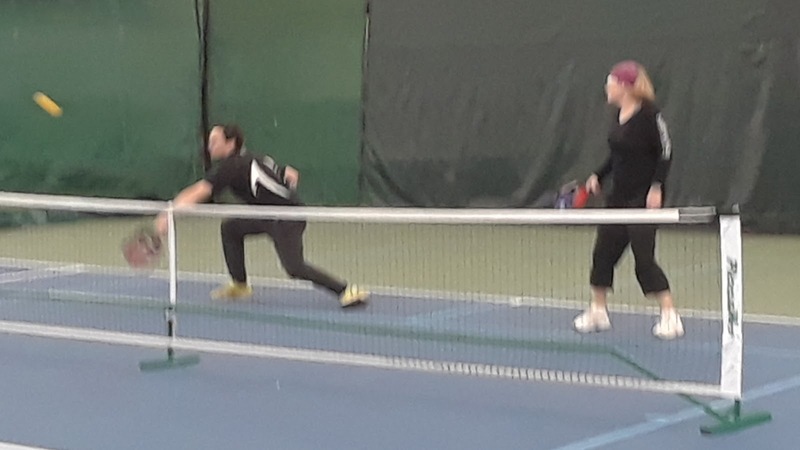 My wife and I love pickleball tournaments. In this FAQ, I hope to answer some of the questions I've received and encourage others to come to the tournaments with us. I don't think I'm good enough for a tournament. Why should I go if I'll just get creamed? The great thing about most pickleball tournaments is that the brackets are based on skill levels. For example, there might be a beginner, intermediate, and advanced brackets. You enter the bracket pertaining to your skill level. This way the tournament is competitive and fun for everybody. How do I know what skill level I am? There are specific definition for skill levels in pickleball. Before filling out the registration form, read them and evaluate where you are. You can also ask more experienced players (ones that have gone to tournaments) where they think you would fit best. Most tournaments have skill levels from 3.0 and up, though I've seen some go as low as 2.5. You can play up a skill level but not down. Why not age groups instead of skill levels? Most small tournaments will only classify based on skill level. After all, does it matter what age you are as long as everyone is at the same level? Large tournaments will have brackets by skill level and age. You can play up a skill level and/or down an age group, but not the other way. Some small or medium-sized tournaments will also have a "golden" division for seniors or a "high school" division for younger players. The skill levels in these divisions can vary greatly, though. If you are still skeptical of not having age groups, I'll tell you about my first tournament experience. Both my wife and I were in our 20s. 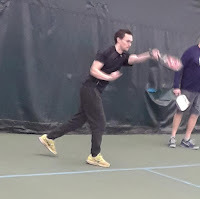 I had been playing pickleball since I was eight years old with my family. My wife is the most athletic person I know. When we arrived at the tournament, there were a bunch of what we considered "old people." We thought the young, athletic folks would take the day. To make a long story short, we got creamed. We found out we didn't know what we were doing. In one game, we lost to a couple of 70-year-olds 11-2. (I would post the video here, but it's embarrassing.) Out of the many games we played, we only won one. We still had a lot of fun - and learned that age doesn't matter much in this game. If I lose one game, am I out? Every tournament is different. However, none of the ones I have entered are single elimination. At the very least, it is double elimination. Most of the ones I've been in involve some sort of round robin. OK, maybe that would be fun. What else do you enjoy about tournaments? There are many things I love about tournaments. Here are just a few. I know I'll probably win some and lose some, but that makes it fun. It is not much fun crushing teams or getting crushed. The skill levels ensure that there will always be competitive games. I find tournaments to be a good way to see if I am improving. Win or lose, I love the challenge. Around here, we play the same people week after week. It is a lot of fun playing someone you have never met before. At a tournament we entered recently, we talked to Chris Wong, a 5.0 player from Sioux Falls. He said that as he has progressed in the sport, he has come to realize that there is a huge social aspect to tournaments, even among the top competitive players. Especially among the top players. Tournaments are a chance for them to get together, catch up, grab a bite to eat, and just hang out. They get competitive on the court, but off of it they are great friends. My wife and I have come to know quite a few people in the tournaments we've entered. We feel that we have "pickleball friends" all over the state. We enjoy meeting new people or catching up with ones we've played before. And we will probably only ever see these people if we go to the tournaments. All right, you've convinced me. How much do they cost? Where are they? What else do I need to know? We are pretty lucky here in Duluth. Not only do we live in God's Country, but pickleball tournaments are pretty close. There are quite a few tournaments in the Twin Cities. Various places in Wisconsin have some, too. There is one in Grand Rapids, MN, in September. Someday we might host our own! The cost to enter a tournament is pretty minimal. It is typically less than $50 per team, usually much less than that. 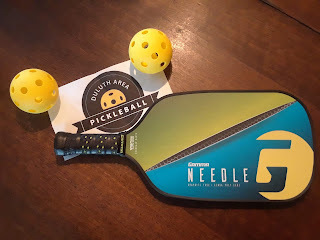 Do you want to play pickleball in Duluth? Come and join us! We recently created the Duluth Area Pickleball Association to help spread the sport of pickleball in Duluth, MN, Superior, WI, and the surrounding area. We help organize play and search for locations to set up courts. In addition to our calendar and information on the association, this website also has general information on the sport of pickleball and its strategy. Feel free to explore and drop us an email if you have questions!